Power hitters never “hang back” (i.e., keep their weight on the right side) through impact. That’s a sure way to lose speed. But they also never allow their upper body to lunge violently toward the target, which leads to slices. Their secret is that they move energy forward while keeping their head behind the ball until after contact. To do this, try using the mental image of a horse race. 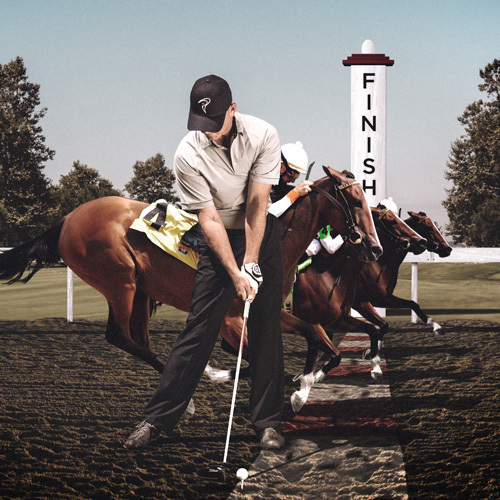 You’re on the track and at the top of your backswing with the outside of your left foot even with the finish line. Your goal? Get your left knee and left hip to cross the line in a photo finish. Do it by shifting your lower body to the left while simultaneously straightening your left leg. If you time it right, they’ll all line up the moment you strike the ball, pouring every ounce of energy into the hit. The catch? Delay turning your upper body as you start down so your chest and head finish out of the money. Get it right and the ball will rocket down the straightaway. For better lower body strength try lunges. 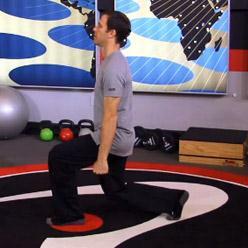 This exercise helps develop your quads, glutes, and hamstrings. 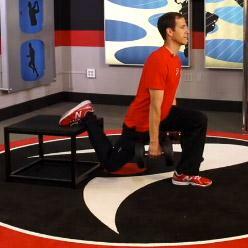 This is a great lower body strength exercise. This drill will help stabilize your lead leg and give you the feeling of posting up on your lead leg. 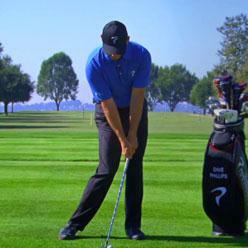 By emulating the proper impact position it will give you a clear feeling of what position your hands should be in at impact, this is a great drill for golfers that are scooping or early releasing.